Osteomyelitis -inflammation of the bone and bone marrow, usually caused by bacterial infection. Patient’s amputation wound was present 3.5 months before the wound became infected, which in turn infected the bone. The patient was then scheduled for a leg amputation below-the-knee (BTK) to prevent a life threatening bone infection. The vascular surgeon, at the patient’s request, agreed to refer the patient for AHI’s Truheal Wound Program. Debridement, dry gauze dressing and wrap. After one week of TRUHEAL wound program the results were visible to the vascular surgeon and the patient. The patient reported no pain, local swelling was greatly reduced and the systemic antibiotics being taken by the patient began to take effect. The amputation was averted. By week 9 the wound was 75% closed. Treatment was discontinued once wound closure reached 96%. Estimated to have saved $140,000 in amputation, hospitalization, physical therapy and prosthetic costs. Patient resides in a skilled nursing facility. Patient requires verbal cues from staff for turning and repositioning. Date of Ulcer onset January 10th. Wound bed noted to have a foul odor with yellowish-greenish drainage. Facility notes wound bed to have an infection present. TRUHEAL Wound Program was started and facility documentation reads that infection is cleared and the wound has been healed. AHI TRUHEAL Program ordered on January 21st. Wound fully resolved May 14th. Burn – patient discharged from the burn center after medical staff assessment determined that skin grafts would not work due to patient age and location of the injury. Elderly woman living alone in assisted living facility. She required assistance with day to day living activities, but there was a support system in place with family, friends and neighbors. Wound was caused by an accident in the kitchen while cooking. 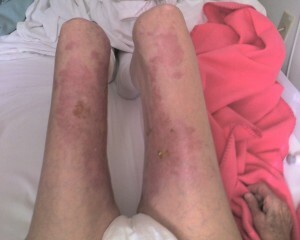 She presented to burn center on May 9th and was admitted to a nursing home on May 16th. Goal of the resident and the family was to achieve wound healing and return her to her permanent residence if possible. Soap and wound wash daily. Cover with non-adherent dressing and secure with Kerlix and cover with gauze dressing and wrap. Wound healed and patient was discharged to home on July 25th – 65 Days of total treatment.